Peonies are stunning, delicate flowers. Native to Asia, southern Europe, and westernNorth America, peonies grow best in cool climates and require winter’s chill for blooms in the spring. Because varieties can be either herbaceous or woody in nature, there is certainly a peony for every need and preference. These long-lasting perennials are an excellent way to add a burst of color to your garden! Herbaceous, or plant-like, peonies prefer cooler climate zones. They will, however, grow anywhere they experience a cold winter, even as far south as northernFloridaandTexasas long as there are few cold weeks of winter. Areas where the temperature dips more than 40 degrees below zero are less than ideal for a peony, which eliminates much of the northern tier of Midwestern andNew EnglandStates. Woody, or tree, peonies are slightly less hardy in the cold. In the northern half of theUnited States, tree peonies may need protection over the winter in order to thrive and produce spring-time flowers. They will grow well into the southern reaches of theUSin all but the hottest regions, producing flowers in spring with exposure to below freezing temperatures during the cold months. Both varieties of peonies have been successful outside of their optimum temperature conditions with a bit of extra care, so it’s quite possible to have success growing peonies throughout much of the United States. In mild climates, plant with northern exposure and avoid mulching to assure that peonies receive the required cold for best production. Ideally, the soil pH should be 6.0 to 7.0. Your local cooperative extension office can test your soil for you, or you can buy pH test kits from hardware stores. Peonies prefer a heavy, rich soil that is well drained. If you have less than ideal planting conditions amend the soil with peat, compost, and fertilizer as needed. If you need to adjust the pH, there are fertilizers available for nearly any soil situation. The best time to plant peonies is fall through frost. A springtime planting may prevent the plant from blooming for a season or two. Choose a location carefully. Peonies don’t like to be moved, so you should consider your new peonies to be permanent residents and space them accordingly. Use the shovel to dig a hole approximately 18” in diameter and 12”-18” in depth. Plants should be 2.5’-3’ apart. Fill the bottom 2”-4” with organic matter (peat, compost, leaves, etc) and add ½ cup of 10-10-10 fertilizer to the hole (or use a fertilizer as needed for your soil conditions). Do not leave fertilizer where it will directly contact the roots. Fill the hole half full of prepared soil. Place the bare root peony in the hole, backfilling under the roots with soil. Be sure that the “eyes” are facing upward, and no more than 2” below the surface of the soil once planted. If the plant is not bare root, prepare the soil as directed and plant the peony as the same level as it was in the pot. Peonies do not like to be transplanted, so this method is less successful than bare root planting. Apply mulch in cold climates, or leave the plant bed exposed for winter in milder regions. Water deeply. If standing water remains, you need to eliminate the ground conditions that allow it. During periods without rain, water deeply once per week. Tree peonies are planted much the same as herbaceous peonies are, but they require a different planting depth. Follow steps 1-4 for woody peonies. Plant a tree tuber with 4”-5” of soil covering the graft (which is often marked by nurseries). 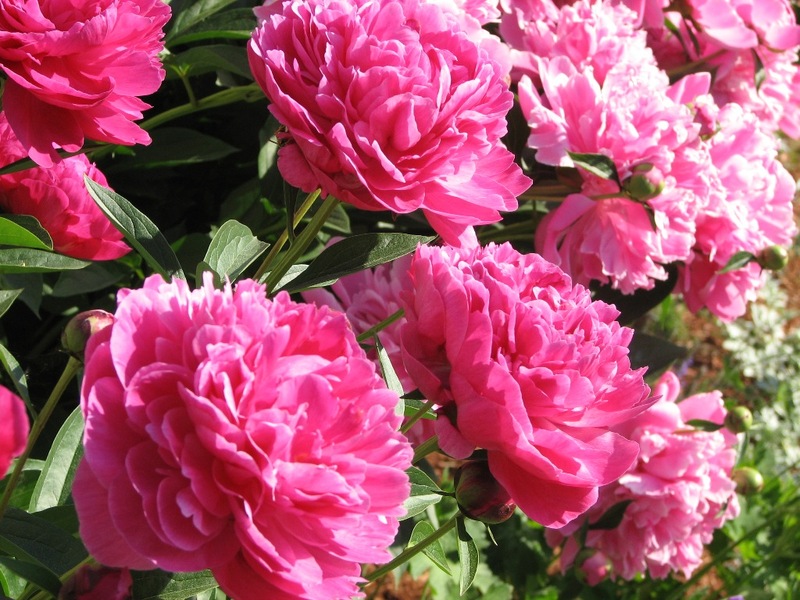 Continue with steps 6-9 for planting peonies. Follow these easy steps for a show-stopping display of flowers each spring! In the spring, add a 2” layer of mulch to deter weeds. When plants are 2-3” tall, add a low nitrogen fertilizer such as 5-10-10. When the first buds appear, remove the side buds from each stem, leaving the terminal (end) bud in place. This encourages show-stopping blooms. When plants grow heavy with blooms, stake behind the plant and secure plants with loops of coated wire in a figure 8 position, with one loop circling the plant and the other the stake, allowing them to cross in the middle. Remove fading blooms to prevent seed development. Cut no more than ½ of the flowers for vases or display, and leave as much foliage on the plant as possible. For young plants, remove no more than 1/3 of the flowers, as this process with reduce flowering for the next spring. To winterize herbaceous peonies and protect against fungus, cut them back to 3” from the soil after a heavy frost. Do not cut back tree peonies. Ants are attracted to the sweet natural secretions of peonies. They do little, if any, harm to the plants themselves. It may take years for peonies to bloom for the first time, especially if they were transplanted. Established peonies tolerate drought conditions well.